Randall Children’s Hospital at Legacy Emanuel encourages kids to be active, play safe and stay healthy throughout the year. This summer, Randall Children’s Hospital is hosting its second annual free, fun and interactive Healthy Kids’ Street Fair on Saturday, September 21 from 10 a.m. to 2 p.m. on North Gantenbein Avenue, in front of Randall Children’s Hospital on the Legacy Emanuel Medical Center campus. The Healthy Kids’ Street Fair takes place right in front of Randall Children’s Hospital. The entire street on North Gantenbein will be shared with our kids and families. Community organizations bring the real fun to the fair with school yard games, hoola hoopers, firefighters, karaoke singers, and crafters, along with many others. 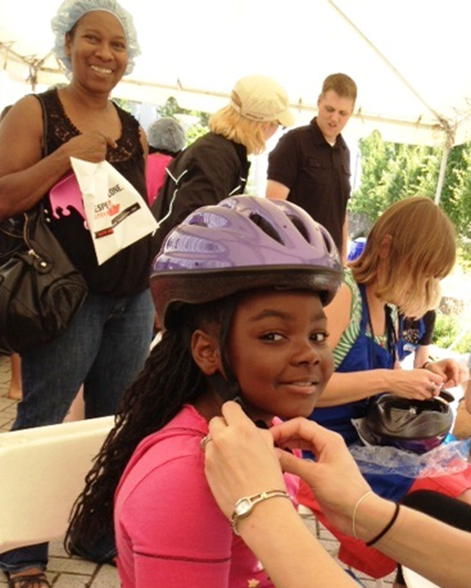 We know that safety is an important part of any summer activity, including bike riding and even skateboarding. Discounted helmets and fitting from Trauma Nurses Talk Tough for toddlers to adults along with fittings are available for just $6 for bike and multisport helmets and $20 for snowboarding helmets. Kids will get to tour the KIDS Team ambulance and a Portland Fire & Rescue fire truck and Portland Police Bureau police car. This year is the 15th anniversary of National Car Safety Seat Check Week. Experts will be recycling old car seats, checking current car safety seats, and teaching parents how to install car safety seats correctly. Low-cost safety seats will be available to qualifying families in need, generously funded by the Oregon Department of Transportation Safety Division. Nurses will be educating families about immunizations, checking children’s immunization records to make sure their immunizations are up to date, and letting parents know the immunizations their children may need according to their ages. The Healthy Kids’ Street Fair will give families a day filled with fun and opportunities to learn about nutrition, health, and safety. For more information visit: http://www.legacyhealth.org/familyfun.